7707 East McDowell Road, Scottsdale, AZ, U.S.A. 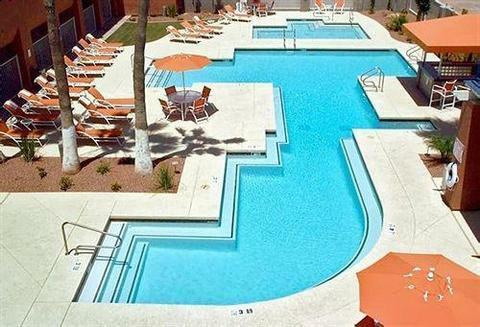 The 3 Palms Hotel, situated in Scottsdale, AZ, is located 7 minutes away on foot from Eldorado Park. In this hotel, pets are allowed. Smoking is also allowed, but only in designated areas. Each room includes air conditioning, a CD player, a DVD player, a safe, a flat screen TV with premium channels and HBO, a coffeemaker, a desk, a hair dryer, an ironing board with an iron, free Wi-Fi, a microwave, and a mini-fridge. Each room also includes either two queen beds or a king bed, depending on the room. In the 3 Palms Hotel, free parking is available. Also available on site, is a bar, a hot tub, fitness facilities, and an outdoor pool. There is a computer station, a laundry service with dry cleaning available, laundry facilities, a bellhop. a 24-hour business center, concierge services, a 24-hour front desk, and room service. The hotel features a rooftop sundeck. Most guest reviews of this hotel that were sourced for this article were very positive. Many guests agreed that this hotel had great value. Many guests made it clear that they were pleasantly surprised with the quality of the hotel, as they had lowered expectations because of the low price they paid. Many guests reported that the rooms were clean and comfortable. Many guests also complimented the look of the rooms, and how well maintained they were. Many guests spoke highly of the location, as it is very close to many eateries and places to shop, as well as points of interest. Many guests enjoyed the pool. These guests claimed that during their stay, the pool was clean and refreshing. Many guests were very satisfied with the room amenities, such as the microwave or the refrigerator. Reviewers often praised the staff as attentive and friendly. There were not many reoccurring complaints made by guests regarding the 3 Palms Hotel, but there was still one major one. Some guests claimed they were getting charged for fees they didn't know about. Some of these guests also claimed to have trouble dealing with these charges. Expedia.com guests rated this hotel 4.1 out of 5 and 89% of guests recommended it based on 3,344 reviews. Hotels.com guests rated this hotel 4 out of 5 based on 2,208 reviews. TripAdvisor.com ranked this hotel #46 of 78 Scottsdale hotels, with an average rating of 4 out of 5 based on 597 reviews. Rating: #18 out of 57 hotels in Scottsdale ranked by guests. "The room was chilly and musty. The heater/air conditioner unit did not work. Office staff staid that it might be unplugged, but did not offer to help. I finally fouun out by myself where the power cord was and where to plug it in. The unit did not work. I told the front office and they said that since it was after 10:00PM they could do nothing. I have NEVER been to a place before that had zero zip nada maintenance support."